Katie Glitz, a graduate student at California State University – Monterey Bay, installs computer platforms on the scientific lab tables inside the research vessel (R/V) Endurance. Click image for larger view and image credit. 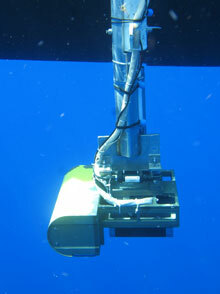 The RESON multibeam sonar installed off the port side of the R/V Endurance. Click image for larger view and image credit. The systems and equipment we will use in our search for deep-water caves include multibeam sonar and a remotely operated vehicle (ROV), both of which involve complex, multi-sensor setups with many components. All the different parts of each system must be connected so that they can communicate and share data with each other as well as with the computers used to record everything. One of the first tasks on any project like ours is to set up or mob (pronounced mobe) the vessel with all the equipment we will need. First, we do a general reconnaissance of the vessel to get a feel for the layout of the cabin, deck space, locations of the engines and propellers, available power outlets, likely placement positions for our sensors, and so forth. Then, we begin installing the components, making all the data and electrical connections, and testing them out. The main parts of most multibeam sonar systems include the following: the sonar itself, which is typically mounted below the waterline on the hull of the vessel or on a pole that can be lowered into the water; one or more computers and electronics modules used to control the sonar, a position, heading and motion sensing system; sensors to measure the velocity (rate of speed) of sound in water; and one or more computers used to control, monitor, and record the incoming data, as well as coordinate the survey. This is the cabin of the R/V Endurance before the expedition team installed its equipment. Click image for larger view and image credit. Here we see the same cabin with all the scientific equipment and computers installed. We are ready to explore! Click image for larger view and image credit. A multibeam sonar uses sound to create a detailed map of the seafloor, by measuring the depth of the water across a wide swath as the vessel is piloted over the area. The sonar we are using for this project is a high-resolution RESON 7125 dual-frequency (200 and 400 KHz) system that is particularly suited to the depth range where we will be searching for caves. The 7125 is capable of making over 25,000 depth measurements (called soundings) every second, across a swath that is up to four times as wide as the water is deep! Such high data density will help us find every nook and cranny in the seafloor that might be a submerged cave entrance or other feature. We will mount the sonar on a pole on the port side of the Endurance, using mounting brackets we brought with us and some beams and a length of pipe provided by the Bermuda Aquarium. The pole can be lowered so that it is vertical, with the sonar in the water when we are surveying, and raised to a horizontal position so it can be stowed while we transit to and from our survey sites. Also mounted on the sonar is a sound velocity sensor, which provides data needed to control the beams of sound that are received by the sonar. Every time the sonar pings and takes its soundings of the seafloor, we also need to measure precisely where our vessel is located, which direction it is pointed, and how it is oriented in all dimensions (pitch, roll, and heave) in order to know where those seafloor measurements came from. So to keep track of the position, heading, and attitude of the Endurance, we are using a Coda Octopus F-185 system. The system requires that we mount two global positioning system (GPS) antennas outside the vessel with a clear view of the sky and at least a 1.5 meter (about 5 feet) separation between them. We must also install a small box called an Inertial Motion Unit (IMU) somewhere on the boat, preferably inside where it will be protected from water and other threats. We mount the antennas on the Endurance’s existing antenna arch, run their cables into the cabin, and bolt the IMU to the deck about amidships near the aft cabin bulkhead. Then we must very carefully and precisely measure the distance between each part of the systems we have installed, so that the offsets can be incorporated into the calculations of the position and depth of all our multibeam soundings. Finally, we must install the data acquisition computers, keyboards, trackballs, and monitors inside the cabin; connect all the sensors together; and make sure they are all working and communicating with one another. A lot of data must travel between the different components, so there are many connections of various types to be made, and the resulting mass of wires and cables quickly start to look like a big spaghetti mess. Because there are so many sensors, data sources, and software packages to run, we need lots of computer monitors to watch and control everything. Once everything is installed and tested, we can go out and collect some data for calibration of the system. After these calibration data are analyzed we will be ready to start the work of mapping. And then, once the multibeam mapping is done, we will de-mob all the multibeam gear, and mob the ROV equipment. But that’s another story . . .